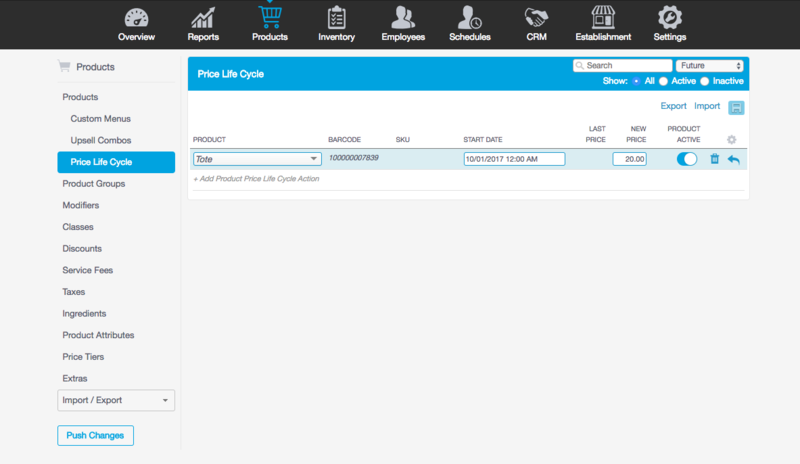 The Price Life Cycle tool gives you the ability to schedule price changes for your products in advance. This feature is useful when planning for promotional events for your business. In the Management Console ([yoursubdomain].revelup.com), begin by navigating to the Products tab. Then select Price Life Cycle. Next, click the Start Date field and select the date and time the price should change. Then click Done. Lastly, in the New Price box, enter the updated price for this product. On the right, click the trash bin icon to completely remove the price change. Then click Continue. To reactive a Price Life Cycle, click the drop-down arrow located in the upper right corner and select All. Then adjust the Active field to activate or deactivate.